Animal health and welfare are key in good livestock farming. Improved biosecurity aims to safeguard and even improve animal health. Biosecurity measures are based on the principle of avoiding direct and indirect contact between groups of animals and reducing the general infection pressure. Biosecurity at herd level is divided into external and internal biosecurity. External biosecurity deals with all measures to prevent diseases from entering and leaving the herd. Jeroen Dewulf said: “What is important here is to have a safe sourcing of animals purchased and to quarantine them before they join the other animals. 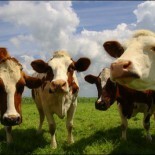 Internal biosecurity is the set of measures to prevent the spread of diseases in the herd. Proper separation of species or categories is useful and the management of diseased animals is especially important to avoid infecting other animals. A total of 80 experts from 23 EU countries gathered in a workshop to exchange practices and experience and make recommendations for innovation and improving biosecurity in poultry, cattle and pigs. “The recommendations include easy measures such as separating the farm into a dirty and a clean area. For cattle it is important to separate different age groups in different compartments. As a general rule, all vehicles should be cleaned and disinfected before entering the farm” said Jeroen Dewulf, who led the workshop. As farmers are busy with daily operations, they often lack the time to make decisions to improve biosecurity on their farms. The University of Ghent in Belgium has developed a free online scoring system in several European languages that supports farmers in assessing and improving biosecurity in their pig or poultry herd through a questionnaire. Through joint initiatives everyone involved can exchange knowledge, raise awareness and encourage others to make the necessary decisions and to take action to improve biosecurity. In the Spanish pig sector biosecurity is a growing concern. Rodent control is extremely important, one rat can contaminate 10 times the amount of feed it eats and is known to transmit 45 diseases including salmonellosis and swine dysentery. Spanish farmers have developed a special device to attract rodents with a non-toxic bait and trap them when they try to eat it. This new type of trap leaves no poison on the farm and no cadavers. It was first tested on the Swine Research Farm in Aguilafuente, Segovia in 2013 with good results. Around this farm, a network of participating farms was set up, promoting the take-up of this specific measure. This led to increased biosecurity and by the end of 2014, 59 farms were taking part and more than 70.000 rats were captured. This has resulted in healthy pigs, less medication, good product prices and happy farmers. This entry was posted on May 17, 2016 by agedchrisharris in Cattle, Meat, Pigs, Poultry, Sheep, Uncategorized and tagged antibiotics, Biosecurity, Dairy, EU, Health, pig, pigs, sheep, welfare.